If you ever wonder where the Village of Schaumburg, IL gets their water from, the first place you might look is the Village’s web site. Posted proudly under the heading, “History,” the site states, “Since 1988, Schaumburg has received 100% of its water from Lake Michigan via Chicago. Before that time, Schaumburg’s water was supplied by 18 wells located throughout the village” (Schaumburg’s Water System). From this point a good question becomes, “Why did Schaumburg switch from city sources to buying from Chicago?” That answer is elusive. In order to find an answer, a clue is provided by Schaumburg. In the event that the Village’s water supply were to be cut off, the Village has a deal with the DuPage Water Commission (DWC). In the worst case scenario, DWC will supply the Village of Schaumburg with water. So where does DWC get their water from? It turns out that they get their water from Lake Michigan, via Chicago. There is one thing that is different and that is DWC makes its water supply history explicit. According to the DWC website, the County was using both deep and shallow wells for all their supply of water. Due to an increasing demand for water, the groundwater was depleting faster than it was naturally being replenished (DWC History). Could this be the reason for Schaumburg’s change in water supply? The Village of Schaumburg, along with DuPage County and northern Cook County, is sitting over what is known as the Cambrian-Ordovician Aquifer System. This is a vast network of groundwater reaching as far north as Minnesota, west through Iowa, and east through parts of Michigan, even extending past the Canadian border. This aquifer has been identified as mostly interbedded sandstone. Because of the hydraulic conductivity, or the speed water moves through the rock, this underground source of water is known to be low in terms of replenishment speed, but also vast in the amounts of water it is capable of storing (Sandstone aquifers). Aquifers like the Cambrian-Ordovician system have been tapped with wells for the purpose of supply drinking water for hundreds of years. Knowing this bit of information, a review of water use in the Chicago area is needed to provide more information on the current availability of water in the area. While the city of Chicago itself has been known for its use of Lake Michigan as a source of water, areas surrounding the city often used other sources due to the high costs involved with moving the water long distances from the lake (Dennis, 2007). 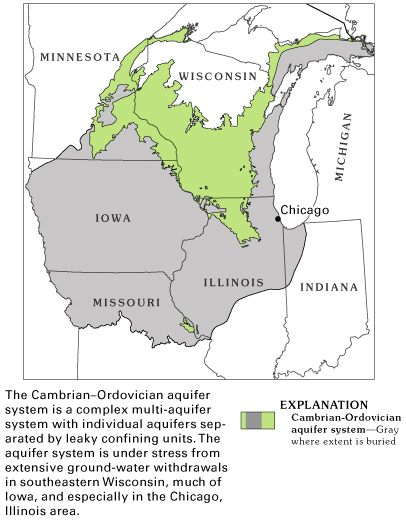 Historically, a total of eight counties in northern Illinois have been using the Cambrian-Ordovician Aquifer as a reliable source of water for many years (Visocky, 1982). When the first deep well was drilled in northern Illinois in 1864, the well had enough pressure to supply roughly 200,000 gallons of water per day. By the year 1900, an increase in population in the area drove an increase in drilling new wells. At that time, the demand had increased considerably, up to 23.2 million gallons per day (MGD). During the next half-century, withdraws increased at a stable rate of almost 1 MGD per year. In 1955, the demand increased to 75.6 MGD and in 1979 that demand was at a record high of 186.2 MGD (Visocky, 1982). The increasing demand was creating problems. As water was being used in great quantities for municipal supply, aquifer water levels were dropping at unsustainable rates. Between 1864 and 1958, the water levels in the Cambrian-Ordovician system fell, on average, 660 feet (Visocky, 1982). By 1980 some areas around northern Cook County and northeastern DuPage had dropped over 900 feet. Ultimately, water was being pulled up from deep underground faster than it was naturally being replenished. The wells were running dry. The situation seemed to go even further than declining water levels in the Cambrian-Ordovician Aquifer system. Chicago’s withdrawals of water from Lake Michigan have created a legacy of controversy and battles among all the Great Lakes states and two Canadian provinces. What if Chicago is using more water than is naturally replenished? What will the effects be to Lake Michigan and the Great Lakes system? There is an underlying concern here, no pun intended, on how Lake Michigan is replenished. The obvious way that any lake gets replenished is through two sources. One is the tributaries that need into it, such as rivers and streams. Another source is precipitation like rain and snow. Those are ways, easily observed, that help keep water levels in Lake Michigan stable. But underneath is a larger system. According to a report by the Great Lakes Science Advisory Board, as much as 79% of Lake Michigan is supplied by groundwater contributions (Groundwater in the Great Lakes Basin, 2010). What all of this means is that while the wells in northern Illinois were drying up, the damage was not only felt in the groundwater levels. The unseen effect touched further out, potentially creating an effect on the water levels of Lake Michigan. In order to protect the Great Lakes, protecting the Great Lakes basin and its groundwater aquifers is also important. Schaumburg itself has seen increased expansions as well. Population and industry have grown at an incredible rate over the last fifty years. In the process, water usage and requirements increased as well. 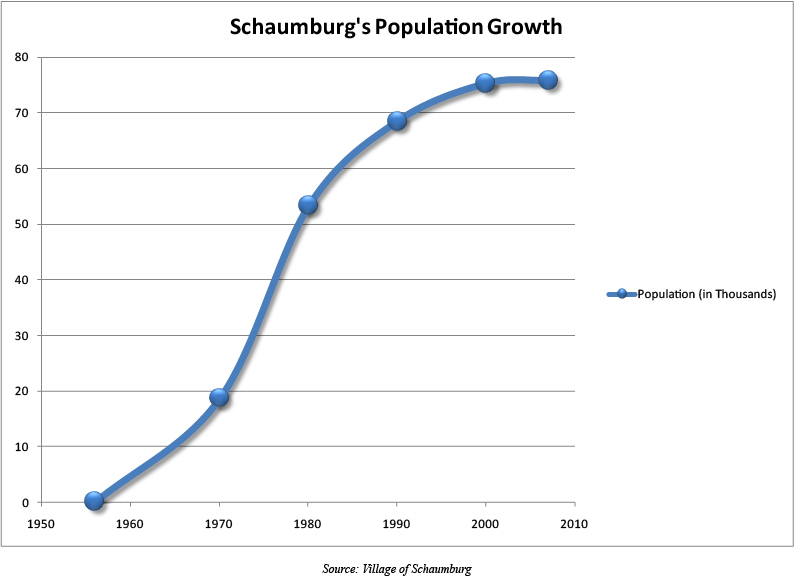 In 1956, the year Schaumburg was incorporated, the population was 156 (Schaumburg’s History). By 1980 that population had grown to 53,305 and Schaumburg was pumping water at a rate of 3.56 MGD, or 66.8 gallons per capita per day (Visocky, 1982). The withdrawals made by Schaumburg, as well as the growing communities around Schaumburg, were simply unsustainable. By 1980, northern Cook County and DuPage had estimated groundwater level decline between 500-600 feet (Avery, 1995) — not as drastic as some areas, but not a good sign. So, is the declining levels of the groundwater the reason Schaumburg abandoned its 18 wells and starting purchasing water from Chicago? Most likely the answer is yes. In collaboration with six adjacent towns, the Joint Area Water Agency (JAWA) was formed (Schaumburg’s Water System). The purpose of JAWA was to build a water pipeline and pumping station, giving the joined communities access to Lake Michigan drinking water. Schaumburg has to date invested over $30 million in JAWA, an expense they would not have been willing to pay if there were other options. One way or another, groundwater or surface water from Lake Michigan, Schaumburg’s supply of water is essentially from the same source — namely, the Great Lakes Basin.